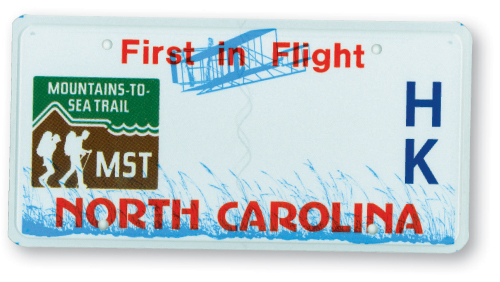 North Carolina drivers can choose one of the state’s 156 specialty license plates to show support for their alma mater or their favorite club or cause. And if Jon Jicha, a professor of design at Western Carolina University, has his way, two more will be added to the roster soon. An avid angler, Jicha has designed one plate to tout WNC’s native brook trout and another to highlight a popular native saltwater fish, the red drum. “These are fish that I’ve always wanted to fight for, to demonstrate the uniqueness of these species,” Jicha says. The plates, which cost $30, are facing a crucial deadline: Each has to have a minimum of 500 applicants by July 1 to become an official option. The N.C. Wildlife Resources Commission is taking applications for the brook trout plate (see details and apply at ncwildlife.org), and the N.C. Division of Marine Fisheries (www.portal.ncdenr.org/web/mf) is taking those for the red drum plate. Proceeds from the tags will go to preserving both species’ habitats.